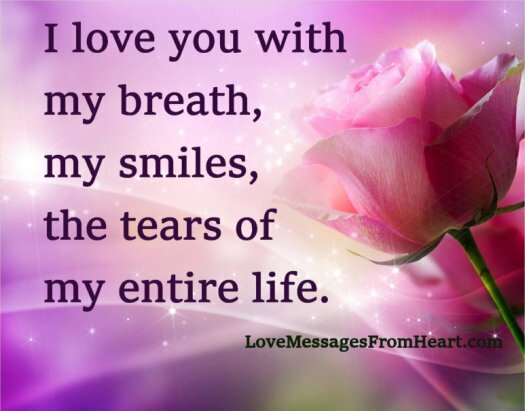 I love you with my breath, my smiles, the tears of my entire life. My dear, know that I love and I always will. That is all. My love for you is immense like the ocean, bright like the sun, sweet like the honey, eternal like time itself. Look into my eyes. What do you see? Yes, you see that I love you with all my heart. Every pore of my body resonates with feelings for you. Yes, I love you dearly. I am not good with words and mostly I am silent, but touch my chest and feel my heart beat the melody of love for you. I love you. I want to be in love with you the same way I am in love with the moon whose light shines out of its soul. So sweet.. it makes me smile.